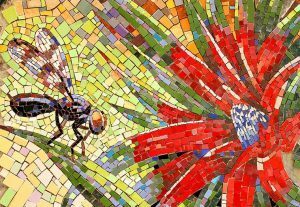 Gary Drostle aims to make commissioning a mosaic a smooth and rewarding experience. 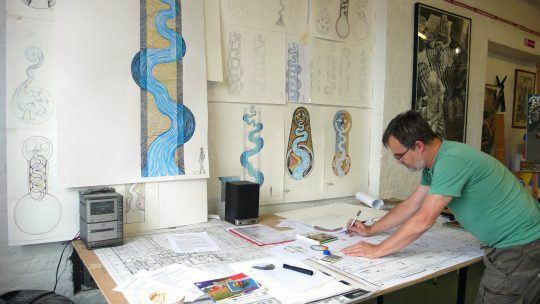 From initial design discussions and sketches, to the final polish, Gary will take care to ensure your finished mosaic is a real talking point. The following six part guide aims to give you a feel for the commissioning process. Mosaic art has a long and distinguished history dating back thousands of years to simple geometric patterns of stones pressed into mud walls and floors. Today, in the British Museum in London, you can see ‘The Standard of Ur’ from Mesopotamia dating back to 1500 BC. The classical style of mosaic really developed during the Greek period. This lead to the practice of cutting tesserae (stone cut into regular cubes for mosaic making). This style of mosaic was then adopted, along with the whole aesthetic of Greek Art, by the Roman Empire. Rome spread mosaic art across the Roman world. 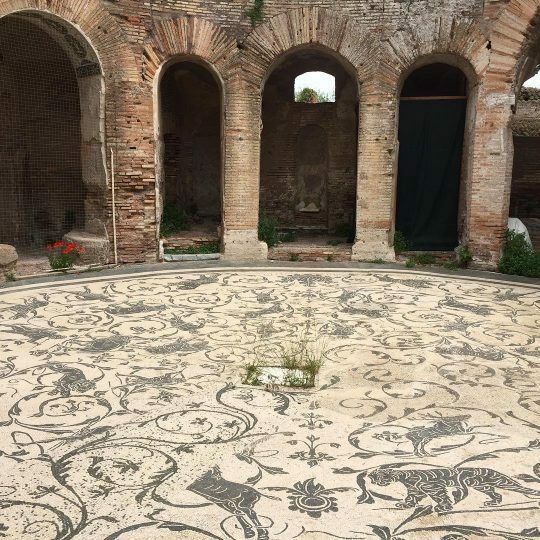 In England alone, a relatively remote corner of the Roman Empire, over a thousand mosaic floors have been discovered. Of course probably the thing foremost in your mind when considering commissioning a mosaic artwork is how much it might cost? Certainly Mosaic Art is a luxury item, every piece is cut and laid by hand meaning that the labour involved. Like all the highest crafts mosaic is very intensive and therefore expensive. There are two basic ways to approach a site specific mosaic as far as cost goes: You can say what size mosaic you want and some information about the design idea and Gary will give you a quote for the work. Or you can share details of your site and how much you have to spend and Gary can suggest what is best within your budget. The size of the mosaic – As you might expect the size of the mosaic has a direct impact on the cost. 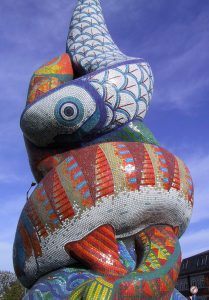 If all the other factors are consistent then the cost of the mosaic will increase directly in proportion to the size of the work. The size and style of the tesserae – As important as the size of the mosaic is the size of the tesserae. The smaller the tesserae the higher the cost. When we talk about tesserae size in mosaic we are talking about the base, maximum, size that the work is made from. Many pieces are cut down smaller from this base size. For instance Gary’s most favoured size is the rectangular 20mm x 10mm block. However for a more Roman style Gary will use a 10mm x 10mm base size. In the same way Gary can create larger scale murals using larger format tiles. The geographical location of the mosaic – Obviously where the mosaic is in the world can make a difference. Although perhaps not as much as you might expect. 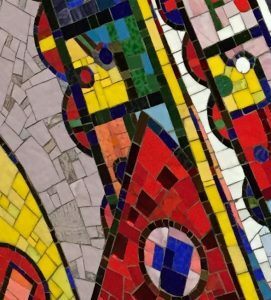 For instance if your mosaic will be sited in the USA the combined factors of low cost shipping and the absence of import tax and UK sales tax means that the price is almost the same as a mosaic in the UK. Elsewhere in the world there may be other import taxes to consider. 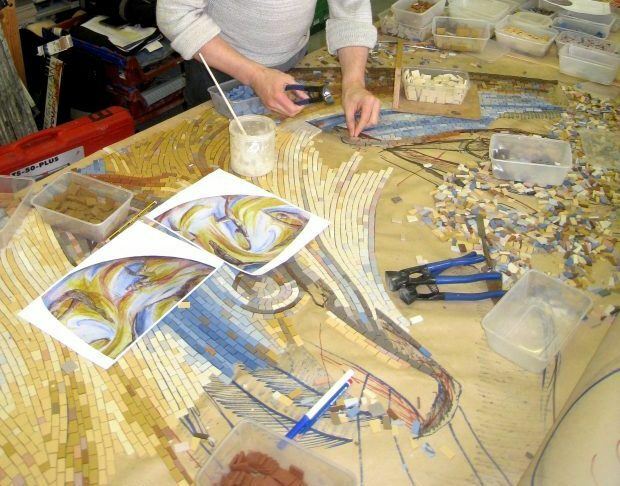 Any special preparation work needed – Most architectural mosaics require a suitable and stable base to be fixed to. If there is other building work going on on site it is usually more economical to get your main contractor to handle the base work if needed. Drostle Public Arts can advise further on this if necessary. It is also possible to create mosaics on panels which can be placed like paving slabs or hung like a gallery picture. Whatever your mosaic plans you can be sure that once you have agreed a costing with Gary this will be the price you pay, no hidden extras. 10% on agreement of the project. 40% on agreement of design before mosaic construction. 30% When the construction of your mosaic is nearing completion, before it is shipped. 20% When the mosaic has been installed and you are happy with the completed works. Stage two – Creating a design that is right for you! Creating the right design is the most important phase of any art commission. It is important not to rush the design. Commissioning your mosaic from Gary Drostle begins with agreeing a brief for the design. In this brief you can give your ideas and we will talk about the site and what is possible. Once you are happy with the brief Gary will go away and draw up choice of sketch designs. These designs will give you a good idea of the directions Gary is going in and will allow you to steer the project how you prefer. Part of the design process also includes checking or specifying the site where your mosaic will be fixed. Specifications for new foundations or the provision of foundations can be provided by Drostle Public Arts to ensure your mosaic has the best support for long life and strength. Site specification can also consider various types of fixing methods, lighting and other aspects of the immediate site design. When you have approved the initial sketch Gary then draws up the final design, this will incorporate any changes or additions you have requested. Hand made glass enamel. This is perhaps the Rolls Royce of mosaic material. Still hand made in the traditional manner in a few workshops around Venice, Glass Smalti comes in a huge range of colours from subtle hues to intense colour. The colour are mostly opaque but also include some transparent colours and vivid metallic colours including silver and a range of 24 carat gold leaf tesserae. Traditionally Smalti is used in small cubes approximately 180mm x 10mm x 80mm but it can also be used in larger plate pieces. The use of larger pieces seen here in our panels for the Paolozzi Mosaics at Tottenham Court Road Underground Station in central London. The classical mosaic material, marble mosaics have a quality all of their own. The material can be used in many ways from rough cut highly textured finishes, through beautiful riven surfaces, to a glass like polish. The natural colours compliment our built environment and the variations and veining of marble means that the surface is aways alive. By sourcing marbles from around the world an array of colours can be achieved. A marble mosaic floor is perhaps the ultimate in luxury flooring. A modern and completely unique ceramic material hand made in France. This material combines the tough exterior durability of porcelain with the beauty, texture and colours of Smalti. A mostly matte unglazed ceramic Litovi is high fired to give it the high strength of porcelain. 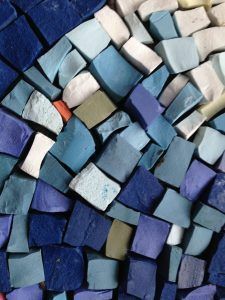 Litovi’s colour palette is much wider than other porcelains and it is designed to be cut with the mosaic makers hammer to give a vibrant and dynamic textured finish. Great for exterior walls. Tough, frost proof and slip resistant, unglazed porcelain is fantastic for floor mosaics. It gives the perfect flat matte finish for floors and only takes 5mm of the floor structure. It can be used in combination with underfloor heating and in pools. Due to it’s clean cutting nature, porcelain can give a very clean precise graphic like rendering. Of course it can also be used on walls, ceilings and wrap around structures. One of Gary’s favourite and often used materials. The machine made glass common in pool mosaics can be used on walls and three dimensional structures. 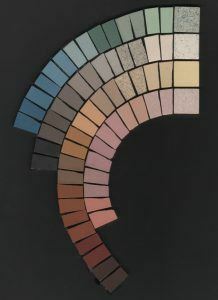 The colour range is bright including bright reds, oranges, pink and greens and a range of iridescent and metallic finishes. Nowadays available in an increasing range of colours the surface of glazed ceramic is flat and glassy which can interfere with the perception of surface. However when used in a modern style can give bright dramatic effect. Though of course most glazed ceramics are not suitable for exterior use, glazed porcelain is great for exterior walls and particularly effective when used in large and mixed size pieces. Gary can make your mosaic for any site in the world. Once your mosaic is complete it is shipped to you and installed by Gary and his team. 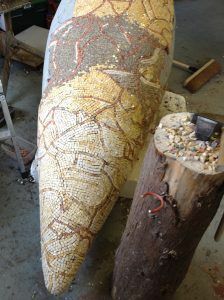 You can visit the studio and see the mosaic under construction, and check that it is just how you want it. You can even add a few tesserae yourself! Because making a mosaic on a bench is easier than on the floor the mosaic itself benefits, from being more precise and with greater attention to detail. Gary begins work on the first mosaic panel for the Lucile Packard Children’s Hospital in California. Once your mosaic is made it is divided into sections and packed ready for transportation to your site. Because your mosaic has been made off site it can be installed when it suits your timetable. 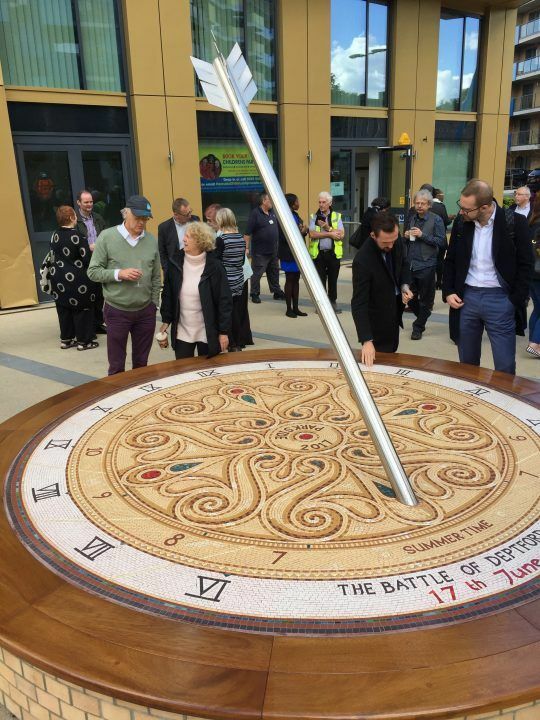 On larger projects Gary is able to co-ordinate the mosaic installation with other contractors and site management. This includes the full provision of method statements and Health and Safety Risk Assessments. When you are ready Gary and his team will come to your site. 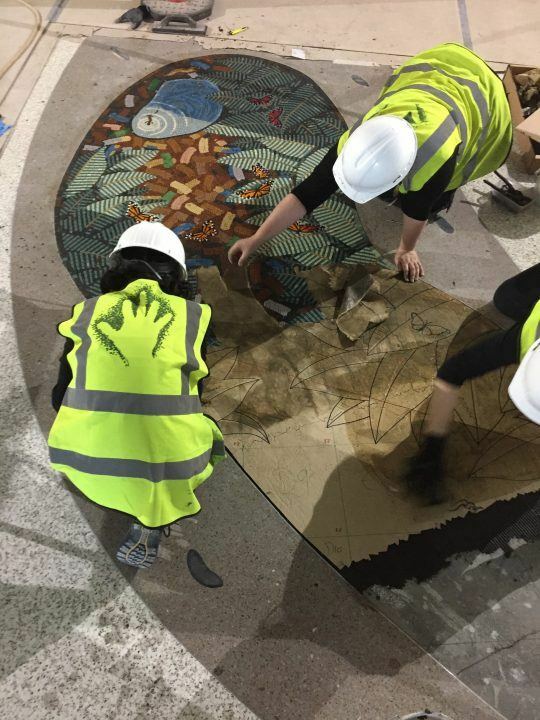 If your site is in the UK they will arrive with the mosaic, if it is outside the UK the mosaic will arrive a few days before the install team to ensure it clears customs and is ready to go. 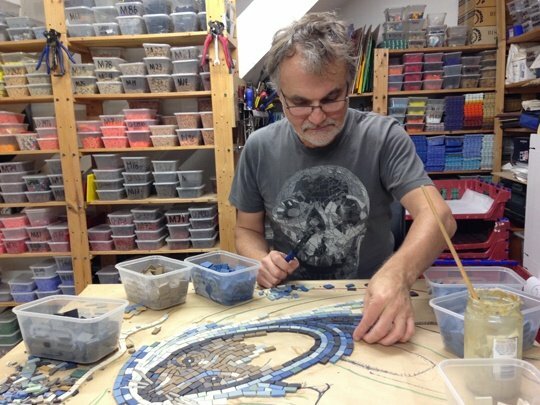 Gary’s team is made up from the same mosaic artists that made your mosaic. This means you can be assured of the same attention to detail in the installation as the making. Your mosaic is installed on site using high quality modern cement adhesives. Then it is grouted and cleaned to give a tough, durable floor surface that will amaze your visitors. Once your mosaic has been installed it is given a final clean and polish before it is formally handed over. Gary will provide you with any maintenance details required if you haven’t received them already and then your mosaic is ready for all to see. Gary retains a keen interest in his work after it is complete and is always available to answer any questions you many have. Are you an architect or designer considering incorporating a mosaic into your building?